Deep water running was an essential tool helping me to train for the Flying Pig Marathon in Cincinnati OH this year. I started running regularly after the birth of my daughter in 2006. Since that time I have struggled with various injuries common to runners including black toenails, blisters, Achilles tendonitis, ITB syndrome, runner’s knee, and even a stress fracture in my femur. My family doctor, two podiatrists, and an orthopedic doctor all basically told me this was what I was to expect from the self inflicted trauma I was placing on my body. In fact, one round ruddy faced urgent care doctor with sweat on his brow went as far as to tell me runners die at an early age. With all this medical advice on my finger tips one would think I would throw in the towel but I love running. From deciding which race to tackle next, to crossing the finish line, to expos & race tee shirts, traveling to different cities, meeting new people and old friends, and all the miles of training in between, I love running. Because running injury free seemed to be elusive to me I decided to try deep water running (DWR) in order to prepare for my next marathon. My first challenge was learning what deep water running is. I had heard of a female runner who won a marathon after training only in water. A quick internet search revealed programs, videos, equipment, even trainers who specialized in DWR. The next thing I had to do was find a pool deep enough and with available times open to training. Freedom Hall certainly is deep enough and the cool water is conducive to training but the times were not. That’s when I decided to train at the Wellness Center in Johnson City. While the lap lanes are limited to 30 minutes the warm water pool was less restricted. I stayed cool and hydrated by keeping a sports drink nearby. I found by using two small aqua belts, one in front and one in back, I was buoyant enough not the hit the bottom of the pool. Finally, injury free running was within reach. There are many techniques and suggestions of how to actually run in the water. Most programs call for the runner to move as close to a natural stride as possible. I decided on a less formal approach and skipped the interval training. My sole goal was to try and keep a pace of 16-18 rotations on one leg in a 15 second time period. With my I-pod attached to my hat, I used the beat of the music to keep a rhythm. By mixing fast and slow songs I mimicked fartleking. During my training I invited friends and family to break up the monotony and I actually met a local triathlete using DWR while recovering from an injury. Finally, I did listen to my physical therapist and incorporated stretching into every work out, which after 4 years of running I have realized is essential to running injury free. 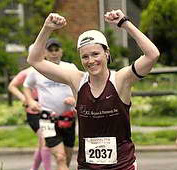 On May 9, 2010, I completed the Flying Pig Marathon and beat my PR by 25 minutes. I spent less hours actually running on the ground than in the pool during training. There are at least three other contributing factors to my time in Cincinnati. For the first time I trained with the Foot Rx running group. Even though it was not often, I felt accountable to someone and benefited from the support and encouragement. Next was getting in the habit of stretching regularly even on my days off. Initially, I only stretched to avoid the inevitable head shaking “I told you so” of my physical therapist, but over time it became habit. Finally, it was the first marathon I ran without an injury. I wasn’t on steroids or regular NSAIDs. I just ran and had fun. Deep water running helped me achieve and exceed my goal and I plan to continue using it as a training tool in the future.